Benefits: Involved in cellular communication and reproduction, reduces oil production, impacts pore shape and pore lining. Note: This is a fat-soluble vitamin. That means it can be stored in your body's fat cells and may build up to toxic levels. Although this is unlikely with OTC vitamins, it is still an important consideration. Sources: Citrus fruits, strawberries, kiwifruit, red & green peppers. Benefits: Antioxidant, protects cells from damage from free radicals, especially UV radiation. Aids in collagen production, an important protein for wound healing and skin health. Note: Water-soluble vitamin, proven to enhance immune function. Sources: Vegetable oils (sunflower, safflower oils, etc. ), nuts (especially almonds! ), green vegetables. Benefits: Super antioxidant! Has potent antioxidant properties that protect your skin from free-radical damage. Promotes all-over skin health! Note: Fat-soluble vitamin, take with meals. Sources: Fish (salmon, tuna, anchovies). Benefits: Fish oil is an amazing source of Omega-3 Fatty Acids. These healthy fats allow cells to maintain a healthy shape and consistency. Fish oil also hydrates skin and reduces inflammation by promoting the production of anti-inflammatory hormones. Note: Fish oil is a great supplement for overall health, it promotes a healthy heart and healthy blood vessels! An all-around winner! 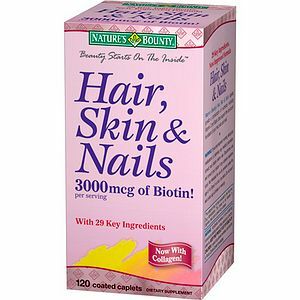 Biotin (Vitamin B7): Helps fatty acids and also instrumental in releasing carbs. Important for healthy hair and skin. Cobalamin (Vitamin B12): Assists nervous system function, formation of red blood cells. Niacinamide (Vitamin B3): Improves circulation. Helps body metabolise fats, carbs and proteins. Deficiency can cause acne. Pyridoxine (Vitamin B6): Helps your immune system to function. Deficiency can cause acne. Riboflavin (Vitamin B2): Maintains mucous membranes in the digestive tract, along with Vitamin A. Vital for healthy skin, hair and nails. Acne is one sign you are deficient in Riboflavin. This is a great option for Hair, Skin, & Nails. Inside the box, the bottle is transparent dark green which is OK for protecting the integrity of the vitamins, especially since the bottle is packaged and shipped inside a box. It is important to understand the concept of synergy! These vitamins will work better when taken together, than taken individually. Look at it this way: Vitamins A & E are fat-soluble, in order for your body to use them appropriately, a fat source MUST be taken at the same time. Fish oil is a great source of healthy fat and additional vitamin A. This means that taking fish oil with your other vitamins will allow them to have maximum efficacy! I typically take my vitamins with a meal but when you combine them properly, taking your supplements with food isn't always necessary. I take 6 fish oils a day combined with 4 opti men vitamins and 2 ginseng pills. I will get the Hair, skin and nail supplements next ! I can see the benefits of the gym already! best protein powder IMO is from Gold Standard Whey Protein, workout your legs as well I always tell people this because a lot of people ignore it but for a bigger upper, u need stronger legs. Take care ! Now most people to aware for his skin care. So you can improve you skin,you must need healthy diet and vitamin supplementation. Vitamin A,C & E is help with rising you skin also protect & repair your damage skin.So I very impress for share about skin care and to protect our skin. This means that taking fish oil with your other vitamins will allow them to have maximum efficacy! I typically take my vitamins with a meal but when you combine them properly Neosporin Eye Ointment, taking your supplements with food isn't always necessary. Fantastic blog site you’ve got listed here.. It is tricky to find substantial good quality producing like yours currently. I truly enjoy persons such as you! Get care!! Thank you. I just found this blog and what a great resource! It is a good blog and their posts are effective. This is very nice post! I will bookmark this blog. Checking out the shelves of my regional extremely shop has always been a challenging job when I want to discover the right base for my experience. The challenging aspect is discovering the right shade, and choosing a Skin foundation that increases my epidermis, and odors reasonable enough to put on throughout the day. I have discovered to make a quit at my regional shopping area beforehand to analyze prospective fundamentals for these aspects. They have a selling occurring, all the better. Building vitamins in your system, which has too much already, or sufficient nutrients can cause harm. Vitamins will make you look younger and feel younger as well as make you feel good about yourself, providing you need regimens suited for your system. Works Cited - Paul, S. “Vitamin B6 B12 Testosterone: Dosage, Side Effects & Benefits.” Testosteroneofficial.Com Ie. Testosterone Official, 02 Nov. 2018, https://testosteroneofficial.com/research/vitamin-b6-b12/. Reference - Logan, P. (n.d.). 5 Best Weight Loss Pills for Men as seen on TV. Retrieved April 4, 2019, from https://phenofficial.com/diet/men/.